If you’re contemplating whether to buy a weight training sled, then let me tell you, it’s definitely worth having as it’ll push you to your limits! Using the weight training sled will give you a tough workout, improving both your strength and stamina. As with box jumps on a plyometric jump box, a weight sled workout will also help you gain more explosive power. In addition, alongside with many other drills, it can also help improve your boxing footwork. However, one of the downfalls about weight sled training is that it requires quite a lot of space. So, if you were planning to get one, unless you have a big enough garden or space in the house, you’ll have to take it to a park or field. Training with the weight sled aka power sled is not a beginner level workout, however, you can start off with no weights just to get use to the exercise. All your muscles will be used and it’ll make your heart beat very fast depending on how intense your workout is. Be careful not to overdo it and gradually increase the weight and intensity. High grade commercial quality with high quality materials and construction. Poles capable of holding 2” Olympic weight plates. Can be pushed on various surfaces due to the smooth curved bases. Only requires a 17mm spanner and large Phillips screwdriver to assemble. 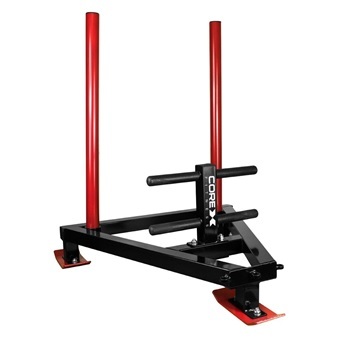 CoreX Prowler weighs 20kg itself. Unit itself is quite heavy so can be quite cumbersome when carrying it from one place to another. Although not the most friendly when transporting this from one place to another due to its weight, but, this is an indication of its sturdiness. Despite that, this is one of the best weight sleds and will give you a great workout. Perfect for a weight sled push or pull workout, unlike other models which only allow you to pull the weight with a harness. Build and develop your resistance strength. Pole diameter is 1” so can accommodate 1” or 2” weight plates. Lightweight making it easy to carry to parks, fields, etc. Includes padded shoulder harness and connecting leads. Can’t be pushed and only be pulled. 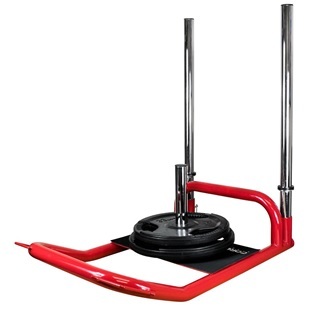 A great cheap option for anyone who wants to benefit from weight sled training at a low cost. Its small size and light weight means it can easily be carried to different places without too much bother. Also, able to accommodate 1” or 2” plates which means if you already owned any 1” weight plates it can be used still. 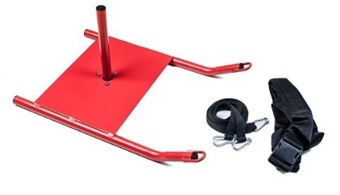 Heavy duty push bars enable you to push or pull the sled. Solid central pole able to accommodate 2” Olympic weight plates. Able to glide over many surfaces. Push bars height are 72.5cm which will be suitable for most users. Two push poles can easily be detached for convenience. May not be as smooth gliding over certain surface types. 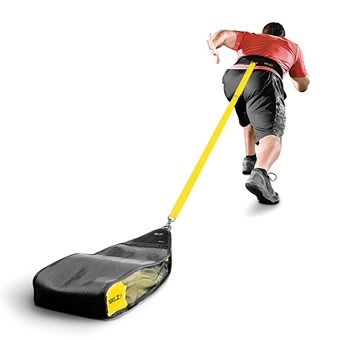 The CoreX Prowler Sled is better to glide over more surfaces. The CoreX Power Sled is a great all rounder for anyone who’s looking to benefit from numerous workouts with a weight sled. 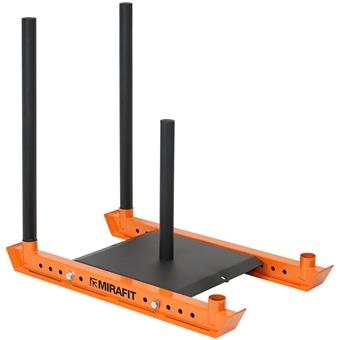 Not as big, bulky or as expensive as the CoreX Prowler Sled, which means it’s easier to carry from one place to another. Can be used on most surfaces, indoor or outdoor. Sack also have handles to perform other exercises such as lunges. Very portable and easy to carry around. Increase or decrease the resistance with the weight bags. Includes 3 weight bags which are filled with sand, weighing 10lbs each. Maximum weight you can fill the sack with is restricted to 30lbs. Take the SKLZ SpeedSack anywhere with you with the clever lightweight portable design. There’s no need to buy additional weight plates since 3 weight bags are already supplied, the only downfall is that the maximum weight is limited to 30lbs. Not ideal for bigger and stronger users who require more resistance. Olympic weight post can hold 2” weight plates up to 50cm high. Heavy duty steel construction built for durability. 88cm high push bars can easily be taken out and placed in the opposite holes when changing direction. Power sled weighs 41kg on its own which is enough resistance for some users. Connection holes allow you to attach harness clips. Very heavy when carrying it from one place to another. Ideal if you have enough space in your own back garden. Want a heavy duty weight sled? The Mirafit M3 is perfect to use in your own garden, although not limited to your garden, it might not be practical trying to carry this 41kg sled to your local park! Diversify your workout with pushing or pulling exercises.